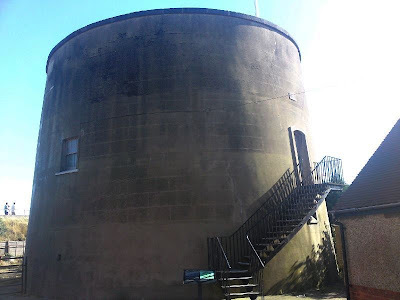 Martello Towers are circular fortified buildings built at the beginning of the 19th Century. 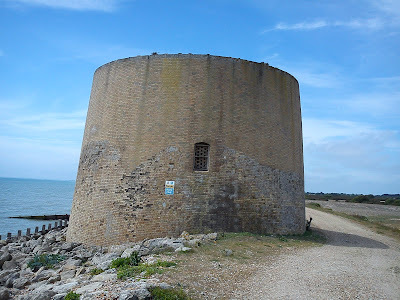 They are based on a tower at Mortella Point in Corsica, the strength of which had impressed British soldiers, and their name is derived from it. The towers are built to a similar design, with a brick pillar in the centre, magazine on the lower floor, accommodation on the upper floor and a gun mounted on the roof. They were intended to accommodate one officer and around 15 soldiers. Two main sets of towers were constructed in Britain to counter the threat of an invasion by Napoleon, one on the South Coast and the other on the East Coast. The South Coast towers stretch from Folkestone in Kent to Seaford in Sussex, and are numbered 1 to 74. 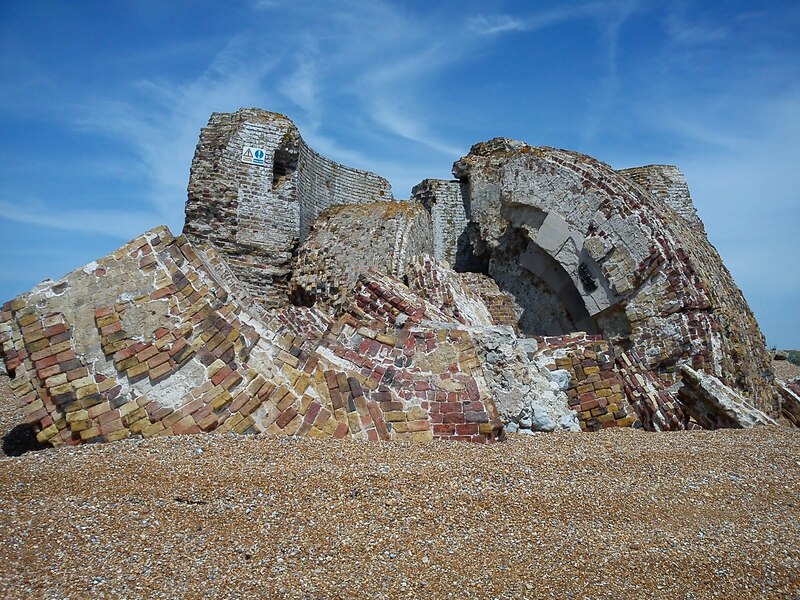 However, due to coastal erosion, artillery testing and residential development, only 25 remain today. 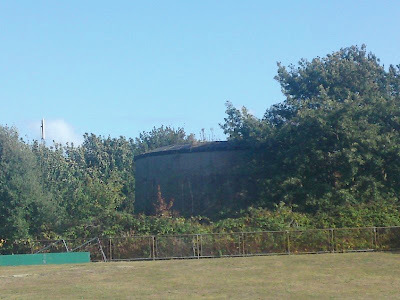 The main barracks associated with the towers was Dymchurch Redoubt, a casemated fort and the towers were backed up by the defensive Hythe Military Canal. 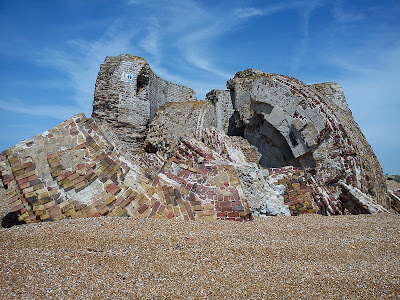 On the East Coast, 29 towers were built, between St. Osyth in Essex and Slaghden in Suffolk, and 18 survive. They are lettered A-Z then AA , BB and CC . Some towers have been converted into private residences or museums, but most of the original remaining ones are empty and have fallen into poor state of disrepair. 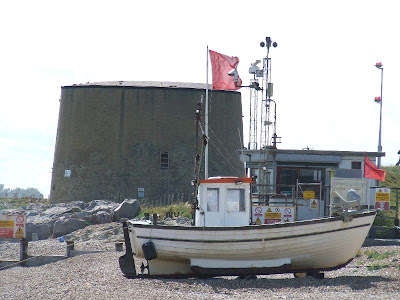 All 25 standing Martello Towers on the South Coast (and one collapsed tower) are pictured here in their numbered sequence, after a few general photos of the key elements of a tower. Many of the towers are privately owned, but they can be seen from the outside. 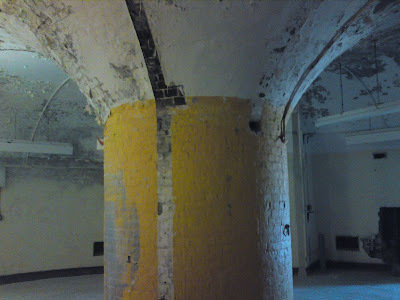 This tower is privately owned and is currently being renovated. 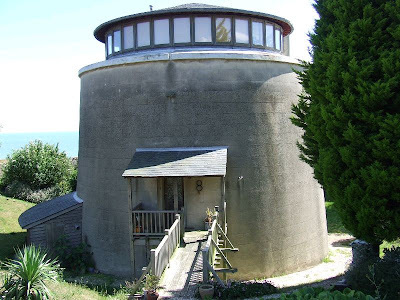 This tower is privately owned and has been converted into home for a holiday lettings. For details click here. 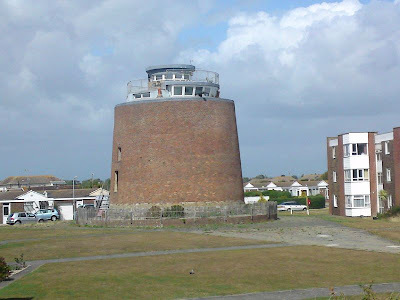 This tower has been converted into a visitor centre, although it seldom seems to be open. 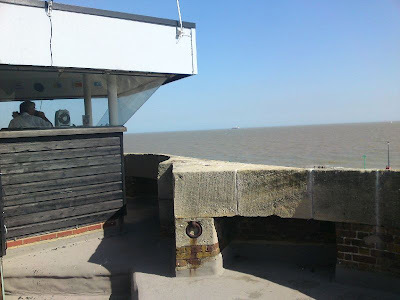 A WW2 observation post has been built onto the roof. 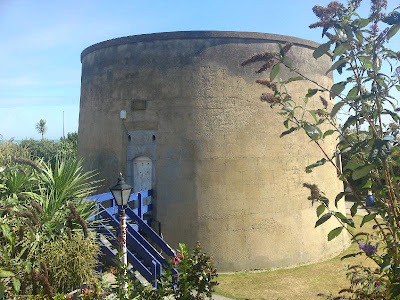 This tower is located in a private garden at the end of 'The Leas'. 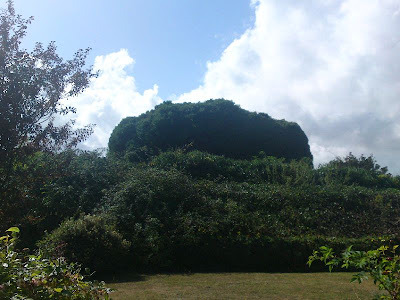 It is completely overgrown with ivy, the brickwork cannot even be seen! It was once used as a Semaphore station. This tower stands in the grounds of a school, it is fenced off but previously reported to be empty with all windows and doors sealed. 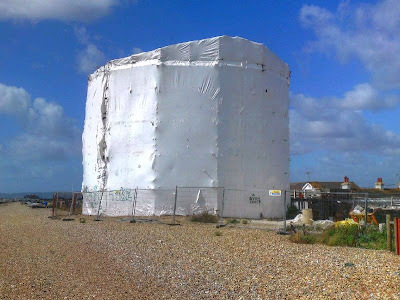 The Stucco covering appears be in good condition and the inland location of the tower has meant that coastal erosion and weathering has not affected it. 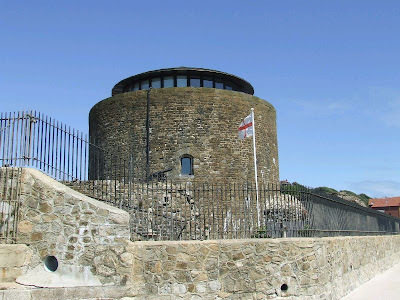 This privately owned 16th Century castle was updated with a Martello Tower, but does not form part of the numbered sequence of towers. It is in line with Tower 5, which is located on much higher ground. This tower is located close to Shorncliffe Camp. It is a deep, heavily overgrown moat and is currently empty. This tower is located close to Tower 6 and is in a similar state. 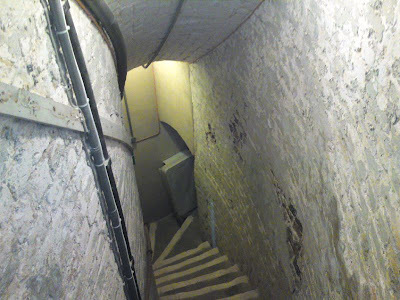 There is no access to either tower due to the depth of the ditch. 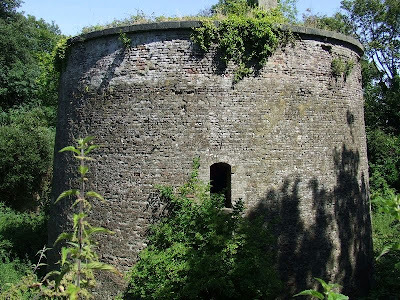 This tower is a private residence and the moat has been turned into a garden. 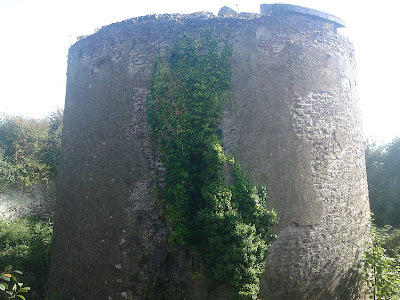 This tower proved to be the most difficult to find, being located at the edge of a large wooded area above Seabrook. The tower's doors are sealed, but there seems to have been recent work on clearing the ditch, and the tower is largely free from ivy. The stones around the parapet have fallen into the ditch, but around half the stucco covering remains. 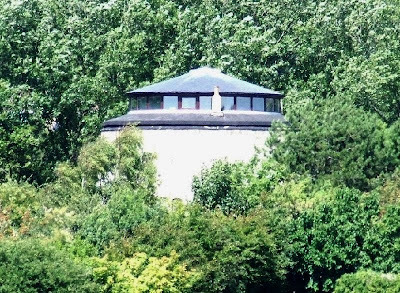 This tower has been converted into a private residence, but in a very different style to most conversions and it has been altered so much that the shape is the only recognisable feature. 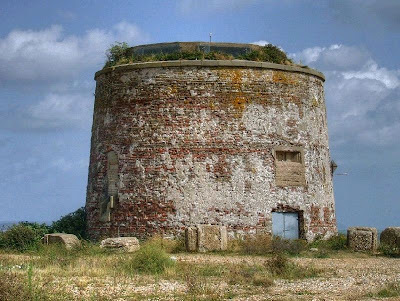 This tower is at the entrance to Hythe Ranges and it is currently empty. Externally, it appears to be in good condition. 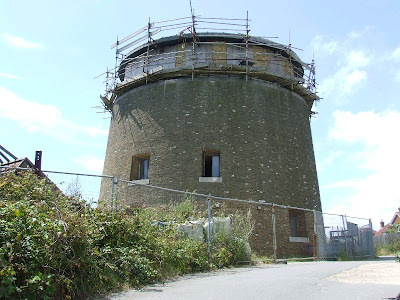 This tower is close to 14 on Hythe Ranges, it is empty and bricked up. The next few towers in line with this one have been eroded by the sea. This tower has been undermined by the sea and has collapsed. 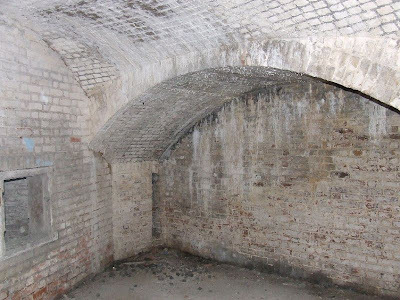 It is interesting as the thickness of the walls can be seen. This tower can only be viewed when the Ranges are not being used. 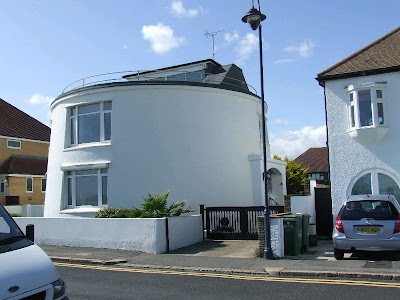 This tower is located on the A259 coast road and has been converted into a private dwelling in the standard style. It appears to have had its Stucco cement covering replaced. 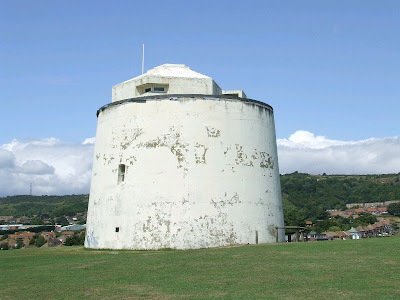 This tower is owned by English Heritage and houses a museum of the Martello Tower system. As with Tower No.3, it doesn't seem to have been open recently. There is a canon mounted on the roof of this tower. This tower appears to be in good external condition, having been restored in the early 1990s. It remains empty, however and the ground level doorway has been boarded up. This tower is located in a moat and is known as the 'Enchantress Tower'. 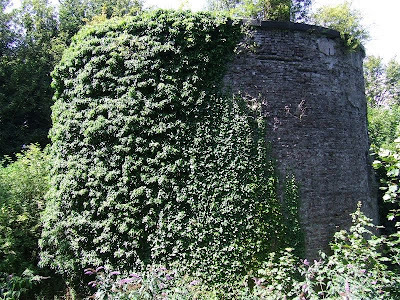 This tower is privately owned and has recently been stripped of vegetation revealing it to be in good condition. 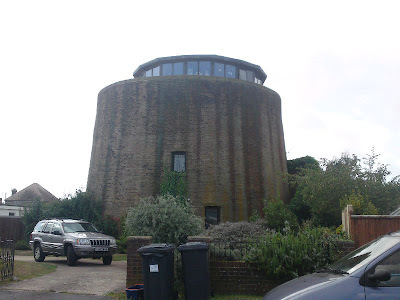 This tower has been converted into a private dwelling in the standard style. 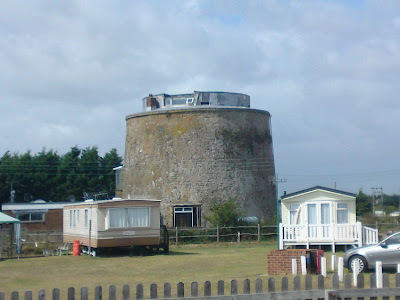 This tower stands inside a caravan park and has had an extension built onto the side. It is obviously used by the owners of the park. The brickwork on this tower is in a poor state, a door has been added at ground level and remains padlocked. 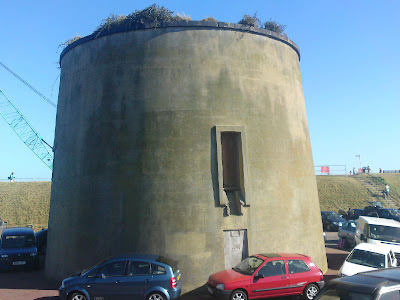 The tower was later used as a machine gun post and has emplacements on the roof and concrete embrasures where the windows used to be. This tower is located on Langley Point, close to the Sovereign Harbour development. 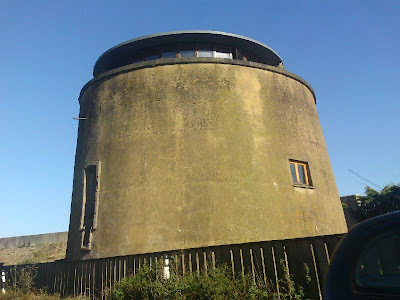 It was used by the Coastguard and has an observation room built on the roof, but is now empty. This tower is known as 'The Wish Tower' and stands in a prominent location on Eastbourne seafront. 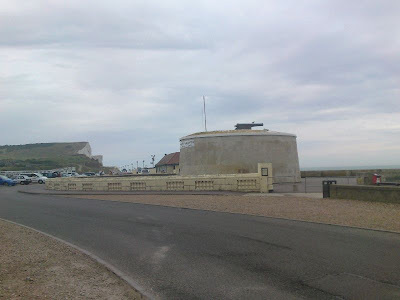 The tower has had a colourful life, being used as a coastguard station, WW2 Battery Observation Post and housing various musuems. The ditch is now a public garden and is open, but unfortunately the tower itself is empty and sealed up. This tower has been renovated and houses a museum. Part of the ditch has been covered to allow more space for the museum, the rest is an open seating area. There is a canon mounted on the roof. I'm an author from Australia. 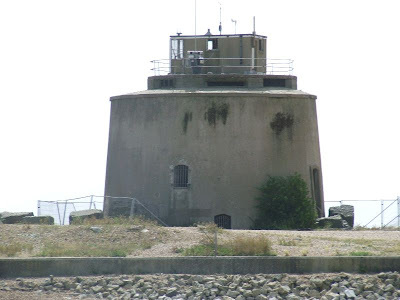 I included a Jersey Martello Tower in my first historical fiction, The Tide Watchers, available in June 2015 (William Morrow Books/HarperCollins). I would love to arrange a tour while I'm in the UK. We'll be staying at Deal for two nights - that's reasonably close, isn't it? We'll have a car.